“We also appreciate the valiant effort made by a student of law as a responsible citizen of Indore and also make a request to the general public that such negligence should not re-occur and it should be more sensitive to the critical cases of such nature and priority should be given to such patients in the traffic”. In a Public Interest Litigation filed by Shri Abhishek Gilke, a law student from Devi Ahilya Vishwavidyala, Indore praying compensation from various authorities of the state government to be paid to a widow for loss of life of her husband Late Vishal Mandloi who succumbed to heart attack being caught in a traffic jam, the Indore Bench of the Madhya Pradesh High Court issued directions to the government to award appropriate compensation to her. The petitioner’s case was on the basis of a newspaper cutting according to which the deceased Vishal Mandloi a 39 year-old Engineer had to lose his life being caught in a traffic jam. The deceased who was residing at Snehlata Ganj suffered serious heart pain and was being taken to the Cloth Market Hospital in an auto-rickshaw. When reached on Jawahar Marg the auto-rickshaw was caught in traffic jam created by a procession carrying thousands of people. Though his wife pleaded for aid nobody extended a helping hand leaving the victim battle for life for an hour in the traffic jam. The victim was declared brought dead to the hospital. The petitioner alleged that various administrative officers of the state government did not take appropriate corrective measures and urged appropriate directions to be issued to ban processions which result in traffic jam and claimed compensation of Rs. 25 lakhs to be paid to the widow of Late Vishal Mandloi. A criminal case was also demanded to be registered against the responsible officials. He relied on a decision of the Odisha High Court at Cuttack in the matter of Chambara Soy v. State of Orissa & Ors. in which the right to move freely and right of protection of life and personal liberty were required to be protected under Article 19(1) (d) and 21 of the Constitution of India. In that case when the death was due to delay in reaching hospital due to road blockage, the Court had held that the State was liable to pay compensation to the family members of the deceased and that it will be open to the State to recover the same from those who were involved in blocking the way. On the other hand, on behalf of the State it was contended that the petition was not maintainable since it had been filed on the basis of a newspaper cutting without verifying the facts. It was submitted that the procession taken out on the particular day was an illegal one as no permission had been granted by the office of the Superintendent of Police for the same. It was also argued that the deceased was caught in the traffic jam only for 10-15 minutes and the actual laxity was on part of the hospital where the deceased was left unattended for nearly one hour. The widow of the deceased produced the letter addressed to her by the Chief Minister Shri Shivraj Singh Chouhan whereby the administration and the members of the public at large were directed not to repeat the mistake in the future to prevent the occurrence of such tragedy and Collector, Indore was directed to grant assistance to her. The Division Bench comprising of Justices Smt.S.R. Waghmare and Shri Sujoy Paul observed that it has not been established that the death had occurred directly as a result of the procession. However in the interest of justice it was directed that the State authorities should strictly adhere to the guidelines issued by the Additional District Magistrate, Indore in the matter of any procession being taken out in the busy routes of Indore. The collector was directed to immediately look into the matter and award proper compensation to Smt. Richa Mandloi, the widow of the deceased as recommended by the Chief Minister in his letter within 3 months from the date of the Court order. The Court also didn’t forget to compliment the 21 year old petitioner for his public spirit. 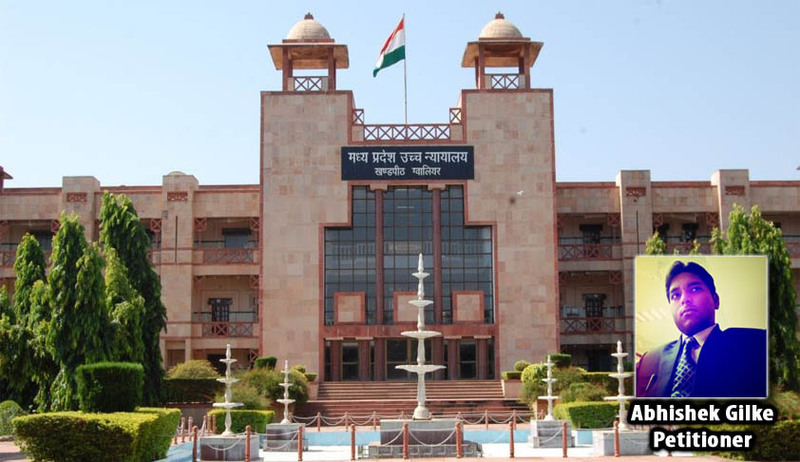 In this regard it was stated “we also appreciate the valiant effort made by a student of law as a responsible citizen of Indore and also make a request to the general public that such negligence should not re-occur and it should be more sensitive to the critical cases of such nature and priority should be given to such patients in the traffic”.